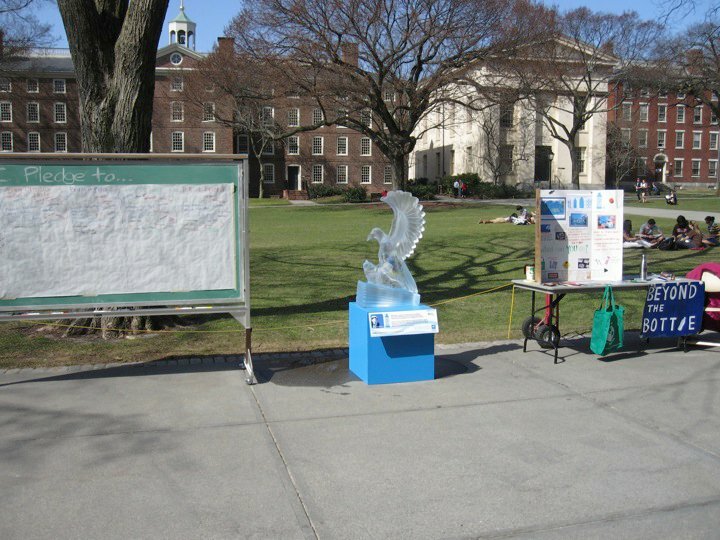 EcoReps hosting of a SurfRider foundation Rise Above Plastics Ice Sculpture this past Friday was a HUGE success! We hosted the Oscar the Osprey (as one of the EcoReps christened him), a four foot ice bird catching a fish! 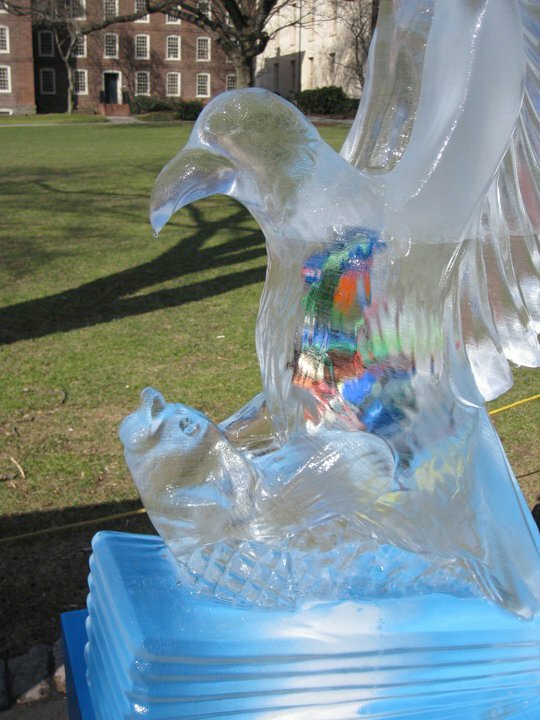 Art in Ice did a terrific job creating a life-like bird filled with colorful plastic the collected at RI Surfrider Foundation beach clean-ups. It was great that people could touch the sculpture! It made it interactive and exciting. Our favorite question was, “What’s inside it?” That was the perfect intro for the EcoReps on site to explain that the sculpture was filled with plastic collected from Rhode Island beaches. We explained that plastic kills 1 million sea birds and 100,000 marine mammals each year. In the morning, we could see into the sculpture so we would have people come see what they could find inside! There were visible bottle caps, straws, even a comb! We would point out to people that this is primarily consumer waste, so we have the power to stop it from ending up in birds, by not using it in the first place! Go Beyond the Bottle – it is estimated that less than 15% of single-use plastic water bottles are recycled nationwide, leaving over 30 million to be sent to the landfill each day (1). Many of those accidentally end up in the worlds oceans where they break down, collect toxic chemical and can be consumed by by birds and fish. By drinking tap water from a reusable bottle, you help to eliminate this part of the problem! Plus tap water is cheap and great! Here in Providence we have the second best tap water in the country (2) ! So, enjoy! Bring your own Reusable Bag – like bottles, plastic bags never bio-degrade and can be very harmful to the environment. Sea turtles and other marine animals often mistake plastic bags for jelly fish and choke when they try to eat them. The solution? Bring your own bag! There are now tons of fashionable and functional options! Vincent Cobb of http://www.reusablebags.com suggests that “on average, each reusable bag purchased and used prevents approximately 400 single-use plastic bags from being distributed. That a lot of bags! Plastic beach trash was showing from inside the Osprey by 3:46pm! Bring your own Plate and/or Utensils – just think of how many plastic utensils you use every day! Especially now that it’s warm out and you want to picnic on the green! Well don’t let your picnicing hurt the earth! Bring your own utensils and plate and eat waste free! You can get great To-Go ware for only $10 at Blue State Coffee on Thayer! Pick-up Litter – A lot a marine debris travels through storm drains or blows of beaches into the water. There the currents pull it out into the ocean. You can stop this by disposing of your trash properly! But I’d like to think you already do that! You can take the extra step of pledging to pick up litter when ever you see it! You’ll be amazed by how much trash you see when you start looking! Tell a Friend – one of the most important things you can do is raise awareness! 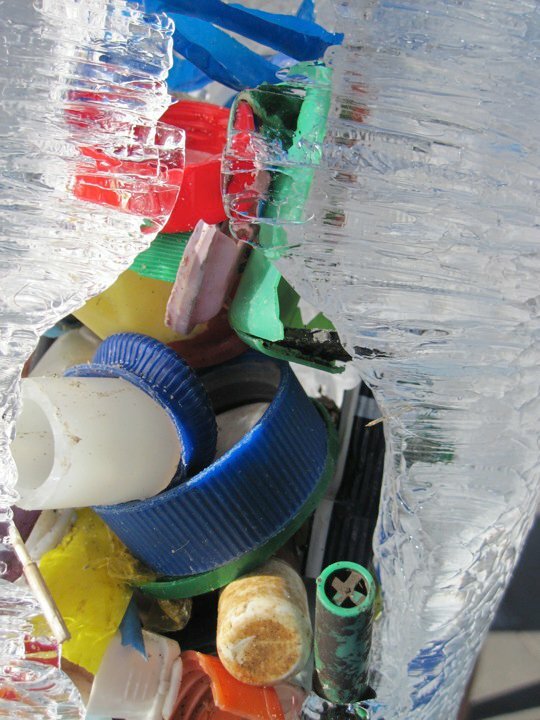 Learn more about marine debris and tell your friends about all the easy steps they can take to reduce their use of plastics. We are happy to report that we got over a hundred sign-ups on these pledges so we hope we are well on our way to helping curb the problem of plastic marine debris. 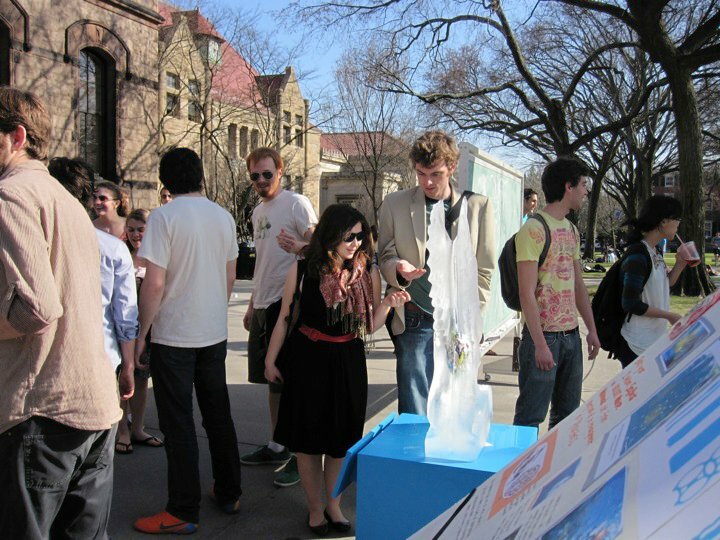 Passers by learning about plastic at 4pm! If you have your own ideas to pledges or want to tell us about what you are doing to reduce you use of plastics, please add ideas in the comments! If you would like to see more photo’s from the event we have hourly photos so you can see how the sculpture melted though out the day! Just click the photos link! Remember ice melts, but plastic last forever! Rise Above Plastics! Another aspect you need to tackle: the growing number of public rest rooms with only hot water faucets at the sinks! Not really best for washing hands, totally unsuitable for filling your water bottle.